When the snow has melted and the sun colors everything green, mountain bike season is open. In the immediate vicinity of La Chapelle, you can tear through the mountain to your heart’s content. The VTT season lasts from mid-June until late August. For the true adrenaline junkies, there are bike parks in the area. 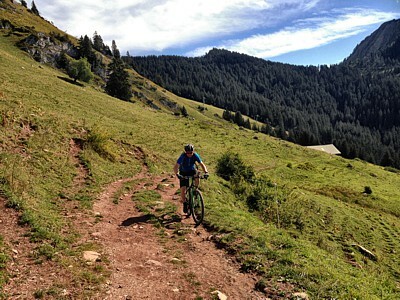 The nearest bike park is located 5 kilometers away in Châtel. Packed in a helmet, knee and shoulder protection, you will race over walls, obstacles, elevated curves, ramps, step-ups and shore sections. You can find information at Portes du Soleil VTT and a map of the mountain biking area. Detailed information, such as interactive maps, webcams and videos, is available (for purchase) at www.vtopo.com. You can also purchase the VTT guide there with more than 50 described routes in Portes du Soleil. The last weekend in every June, the Passportes du Soleil MTB Festival is held! More than 6,000 mountain bikers can register to kick off the mountain biking season. There are 6 pit stops that weekend where you can purchase local specialties to satisfy your hunger and thirst. There are also numerous demos and stands, and big names from the sporting world take part in this event.